For complete step by step instructions to installing a daughterboard, please see the USRP N Series Quick Start (Daughterboard Installation) or USRP X Series Quick Start (Daughterboard Installation) guides. Never allow metal objects to touch the circuit board while powered. Always properly terminate the transmit port with an antenna or 50Ω load. Always handle the board with proper anti-static methods. Never allow the board to directly or indirectly come into contact with any voltage spikes. Never allow any water, or condensing moisture, to come into contact with the boards. Always use caution with FPGA, firmware, or software modifications. Never apply more than -15 dBm of power into any RF input. Technical support for USRP hardware is available through email only. If the product arrived in a non­functional state or you require technical assistance, please contact support@ettus.com. Please allow 24 to 48 hours for response by email, depending on holidays and weekends, although we are often able to reply more quickly than that. We also recommend that you subscribe to the community mailing lists. The mailing lists have a responsive and knowledgeable community of hundreds of developers and technical users who are located around the world. When you join the community, you will be connected to this group of people who can help you learn about SDR and respond to your technical and specific questions. Often your question can be answered quickly on the mailing lists. Each mailing list also provides an archive of all past conversations and discussions going back many years. Your question or problem may have already been addressed before, and a relevant or helpful solution may already exist in the archive. 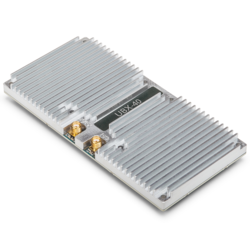 Discussions involving the USRP hardware and the UHD software itself are best addressed through the u​srp­-users ​mailing list at http://usrp-users.ettus.com. Discussions involving the use of GNU Radio with USRP hardware and UHD software are best addressed through the d​iscuss­-gnuradio​ mailing list at https://lists.gnu.org/mailman/listinfo/discuss­gnuradio​. The support page on our website is located at https://www.ettus.com/support​. The Knowledge Base is located at ​https://kb.ettus.com​. Every country has laws governing the transmission and reception of radio signals. Users are solely responsible for insuring they use their USRP system in compliance with all applicable laws and regulations. Before attempting to transmit and/or receive on any frequency, we recommend that you determine what licenses may be required and what restrictions may apply. If you have any non­-technical questions related to your order, then please contact us by email at orders@ettus.com​, or by phone at +1­408­610­6399 (Monday-Friday, 8 AM - 5 PM, Pacific Time). Please be sure to include your order number and the serial number of your USRP. This page was last modified on 14 May 2016, at 17:00. Other product and company names listed are trademarks or trade names of their respective companies.